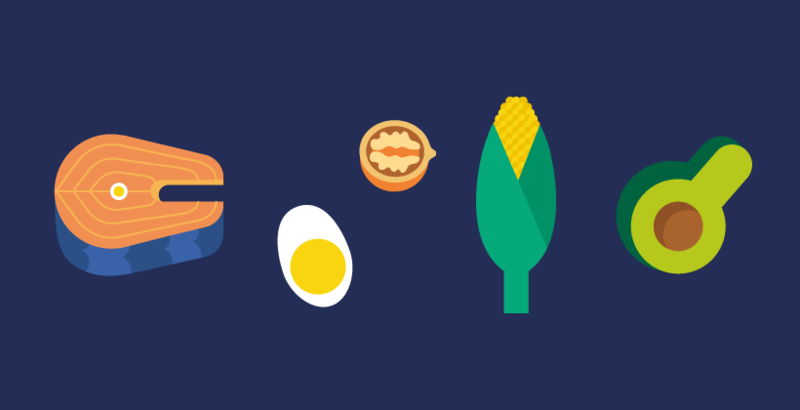 EUFIC’s review Facts on Fats provides the reader with an extensive, though easy to understand, overview of the various aspects related to the fats we consume through our diets. To make this information easier to digest, the review is divided over two parts; the first, the current article, explains the Basics of dietary fats. It clarifies what dietary fats are, how fats differ from a molecular perspective, which roles they play in the human body (briefly), and the importance of fats in food technology. The second part is a review of the scientific literature on Dietary fats and health. It explains the most recent advances in nutrition science on the consumption of dietary fats and how this impacts health. 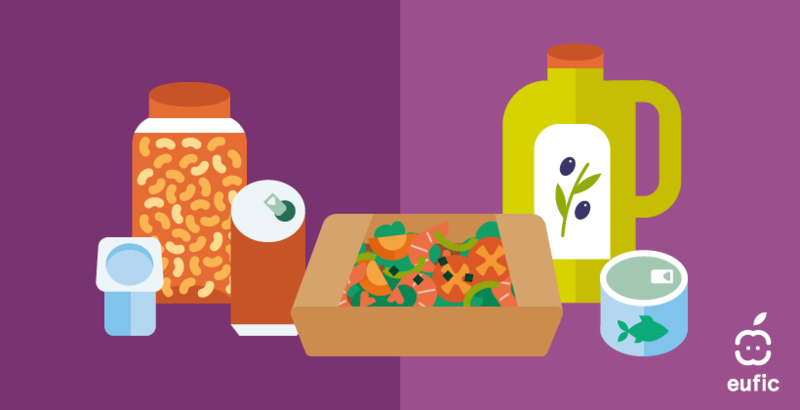 It also covers dietary recommendations from international authoritative bodies and the different Member States, and current consumption levels throughout Europe. 2. What are dietary fats? Dietary fats are naturally occurring molecules that are part of our diet. They belong to a larger group of compounds named lipids that also include waxes, sterols (e.g. cholesterol) and fat-soluble vitamins. However, this distinction is not always clear, and sometimes the term fats also include other lipids, such as cholesterol. Dietary fats molecules originate from plants and animals. In plants, they are found in seeds (e.g. rapeseed, cottonseed, sunflower, peanut, corn and soybean), fruits (e.g. olive, palm fruit and avocado) and nuts (e.g. walnuts and almonds). Common animal fat sources are meat, (oily) fish (e.g. salmon, mackerel), eggs and milk. Both plant, or, as often called, vegetable fats, and animal fats can be consumed as they naturally occur, but also indirectly, for example in pastry and sauces, where they are used to improve texture and taste. Milk yields many popular animal fat products, such as cheese, butter, and cream. Apart from milk, animal fat is extracted primarily from rendered tissue fats obtained from livestock animals. Dietary fats, together with carbohydrates and proteins, are the main source of energy in the diet, and have a number of other important biological functions. Besides being structural components of cells and membranes in our bodies (e.g. 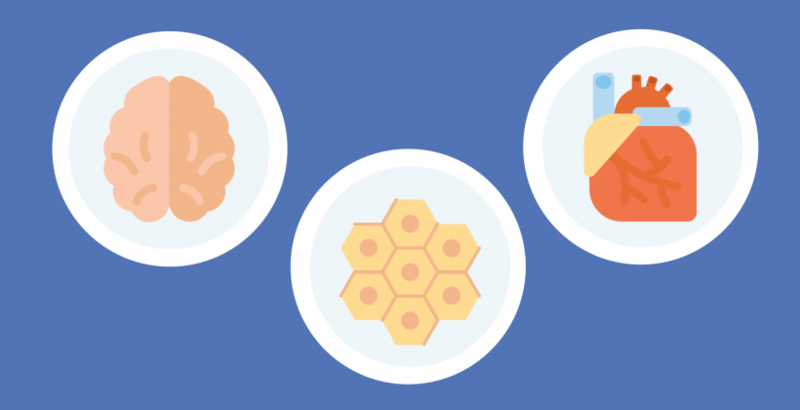 our brain consists mainly of fats), they are carriers of fat-soluble vitamins from our diet. Fat metabolites are involved in processes such as neural development and inflammatory reactions. When stored, body fat provides energy when the body requires, it cushions and protects vital organs, and helps to insulate the body. The lipid cholesterol, found in products like cheese, eggs, meat, and shell fish, is essential for the fluidity and permeability of the membranes of body cells. It is also the precursor of vitamin D, some hormones, and bile salts, which enhance the absorption of fats in the intestine. The importance of dietary fats and cholesterol for human health is further explained in the second part of Facts on fats: Dietary fats and health. 3. Zooming in on the molecular structure, how are dietary fats built? Understanding the basic chemistry of fats will help to understand the role that fats play in our health and in food technology. Over 90% of dietary fats are in the form of triglycerides, which consist of a glycerol backbone with fatty acids esterified on each of the three hydroxyl groups of the glycerol molecule. Fatty acids have a backbone made of carbon atoms. They vary in the number of carbon atoms, and in the number of double bonds between them. For example, butyric acid (C4:0), palmitic acid (C16:0) and arachidic acid (C20:0), contain 4, 16 or 20 carbon atoms in their chain, respectively. Short-chain fatty acids (SCFA) are fatty acids with up to 5 carbon atoms, medium-chain fatty acids (MCFA) have 6 to 12, long-chain fatty acids (LCFA) 13 to 21, and very long chain fatty acids (VLCFA) are fatty acids with more than 22 carbon atoms. The majority of naturally occurring fatty acids, both in the diet and in the body, contain 16-18 carbon atoms. Annex 1 provides a list of the most common fatty acids, their number of carbon atoms, the numbers and positions of double bonds, and in which products these fatty acids can be found. Fatty acids are classified according to the presence and number of double bonds in their carbon chain. 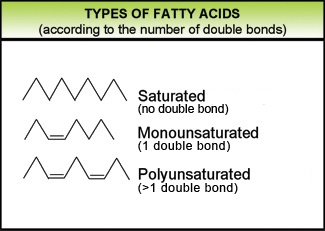 Saturated fatty acids (SFA) contain no double bonds, monounsaturated fatty acids (MUFA) contain one, and polyunsaturated fatty acids (PUFA) contain more than one double bond. Both length and saturation of fatty acids affect the arrangement of the membrane in our body cells and thereby its fluidity. Shorter chain fatty acids and ones with greater unsaturation are less stiff and less viscous, making the membranes more flexible. This influences a range of important biological functions (see Facts on fats: Dietary fats and health). 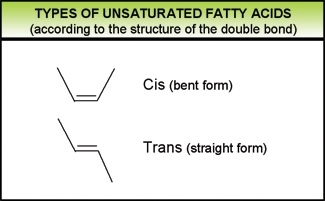 Unsaturated fatty acids can also be classified as "cis" (bent form) or "trans" (straight form), depending on whether hydrogen is bound on the same, or on the opposite side of the molecule. Most naturally occurring unsaturated fatty acids are found in cis form. Trans fatty acids (TFA) can be divided in two groups: artificial TFA (industrial) and natural TFA (ruminant). Industrial TFA are produced by humans and can be found in products containing vegetable oils/fats that have undergone a hardening process known as partial hydrogenation (this will be further explained in section 4). Small amounts of TFA can also be generated during the deodorization of vegetable oils/fats, the final step in edible oil/fat refining. A range of TFA isomers (varieties) exist and are structurally different in the position of the double bond along the fatty acid molecule. Both ruminant and industrial TFA contain the same isomers, with a wider range of structures in industrial TFA, but in different proportions. TFA consumption is linked to adverse health effects1, which is further explained in EUFIC’s Facts on fats: Dietary fats and health. Omega-3 (or n-3) fatty acids have the first double bond at the third carbon atom and include mainly alpha linolenic acid (ALA) and its derivatives eicosapentaenoic acid (EPA) and docosahexaenoic acid (DHA). Omega-6 (or n-6) fatty acids have the first double bond at the sixth carbon atom and include mainly linoleic acid (LA) and its derivative arachidonic acid (AA). Omega-9 (or n-9) fatty acids have the first double bond at the ninth carbon atom and include mainly oleic acid. In addition to their formal name, fatty acids are often represented by a shortened numerical name based on the length (number of carbon atoms), the number of double bonds and the omega class to which they belong (see Annex 1). Examples of nomenclature are; Linoleic acid (LA), which is also referred to as C18:2 n-6, indicating that it has 18 carbon atoms, 2 double bonds and belongs to the omega-6 fatty acid family. Alpha linolenic acid (ALA), or C18:3 n-3, has 18 carbon atoms, 3 double bonds and belongs to the omega-3 fatty acid family. They are important in the formation of cell membranes and are involved in many physiological processes such as blood clotting, wound healing and inflammation. Although the body is able to convert LA and ALA into the long chain versions – arachidonic acid (AA), eicosapentaenoic acid (EPA), and to a lesser extent docosahexaenoic acid (DHA), this conversion seems limited.2 For that reason we may also need direct sources of these particular long chain fatty acids in our diet. The richest source of EPA and DHA is oily fish, including anchovy, salmon, tuna and mackerel. A source for AA is peanut (oil). 4. What role do fats play in food-technology? Fats are used in a wide range of applications, and have many functional properties that contribute to a final product (see Table 1). Table 1. Functionality of fats in foods products. Products such as cakes or mousses need air incorporated into the mixture in order to give a well-risen texture. This is usually achieved by trapping bubbles of air in a fat-sugar mixture to form a stable foam. A crumbly texture found in some pastry and biscuits is achieved by fat (shortening) coating the flour particles to prevent them from absorbing water. Fats help separate the layers of gluten and starch formed in the dough when making flaky or puff pastry, or biscuits. The fat melts during cooking, leaving little air pockets, while the liquid produces steam that evaporates and causes the layers to rise. Fats help retain a product's moisture content and therefore increase its shelf life. Fats give a glossy appearance to food, for example when poured over hot vegetables, and add shine to sauces. Solid fats do not melt immediately but soften over a range of temperatures. Fats can be processed to rearrange the fatty acids and alter their melting point. This technology has been used to produce spreads and cheeses that spread straight from the fridge. In deep frying, the food is completely surrounded by the frying fat which acts as an efficient heat-transfer medium. The suitability of a fat for food manufacturing depends on its physical properties, such as the melting temperature and thermal stability. Fats are made up of a combination of different fatty acids, but one type generally predominates, which determines the physical characteristics. Fats that contain a high proportion of SFA, such as butter or lard, are solid at room temperature and have a relatively high melting temperature. Most vegetable oils, which contain higher levels of MUFA or PUFA, are usually liquid at room temperature. Fats can be interesterified, as an alternative to the hydrogenation process, without the formation of TFA. In this chemical process, the fatty acid chains are rearranged within or between the triglyceride molecules, creating new triglycerides. SFA in most vegetable fats are located in the outer positions of the triglyceride molecule (the sn-1 and sn-3 positions). Interesterification leads to the generation of fats with a higher proportion of SFA in the sn-2 (middle) position, similar to that of animal fats such as lard. The process is carried out by blending different oils (e.g. a liquid and a fully hydrogenated oil). With the help of chemical catalysts or enzymes, the fatty acids are redistributed, without modifying the actual fatty acid molecules. The newly formed triglycerides alter the fat’s properties like hardness, plasticity and heat resistance. From a health perspective, TFA from partially hydrogenated vegetable oils should preferably be replaced by vegetable oils rich in MUFA and PUFA (instead of animal fats and oils rich in SFA).4 One of the ways could be replacing TFA by novel or "trait-enhanced" oils. These oils, produced from seeds with novel fatty acid composition, have a high content of unsaturated fatty acids. They can replace the trans fats while maintaining food product quality. However, limited market supplies of these substitute oils may be a bottleneck.7 Also, for certain applications, fats that are solid at room temperature are needed, and the replacement of TFA needs to be compensated to some extent by SFA, to not compromise the quality of the product. To this end, the most widely used replacers are fully hydrogenated vegetable oils with interesterified stearic acid (explained above) and palm oil, both high in SFA. Like any vegetable oils such as rapeseed oil or sunflower oil, palm oil contains virtually no TFA (maximum 2% on fat basis), and contains about 50% SFA, which makes it naturally solid at room temperature. These properties allow for a range of applications, and it has been widely used to replace partially hydrogenated vegetable oils. From a nutritional point of view, as with all saturated fats, moderating its intake is advisable. Dietary fats are an important part of our diet, delivering about 20-35% of our daily energy needs. Beyond energy, they are indispensable for a number of important biological functions including growth and development. 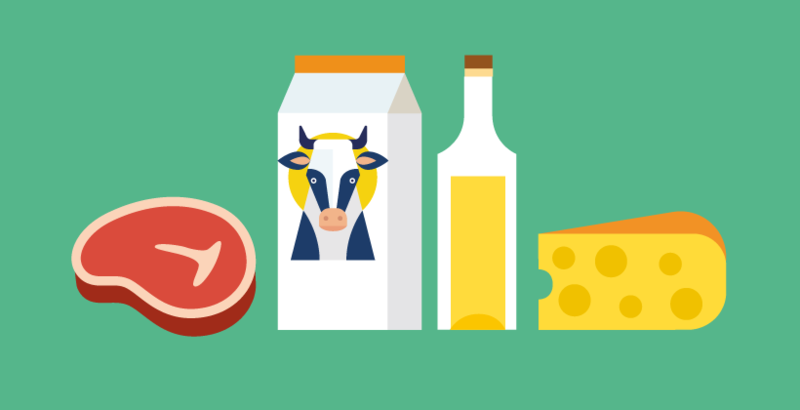 This first part of the EUFIC review Facts on Fats - the Basics, explains what dietary fats actually are, where they can be found, what is their molecular structure, and what technological properties they have to improve taste, texture, and appearance of foods. The second part of the review, Dietary fats and health, addresses the consumption of dietary fats and how it relates to human health. For more information please see our Dietary fats infographic which is available to download, print and share. (*) The figure before the colon indicates the number of carbon atoms the fatty acid molecule contains, and the figure after the colon indicates the total number of double bonds. The n-(omega) designation gives the position of the first double bond counting from the methyl end of the fatty acid molecule. Brouwer I, Wanders A & Katan M (2013). Trans fatty acids and cardiovascular health: research completed? European Journal of Clinical Nutrition 67(5): 1-7. Brenna T, Salem N, Sinclair A, et al. (2009). α-Linolenic Acid Supplementation and Conversion to n-3 Long Chain PUFA in Humans. Commission of The European Communities (2007). 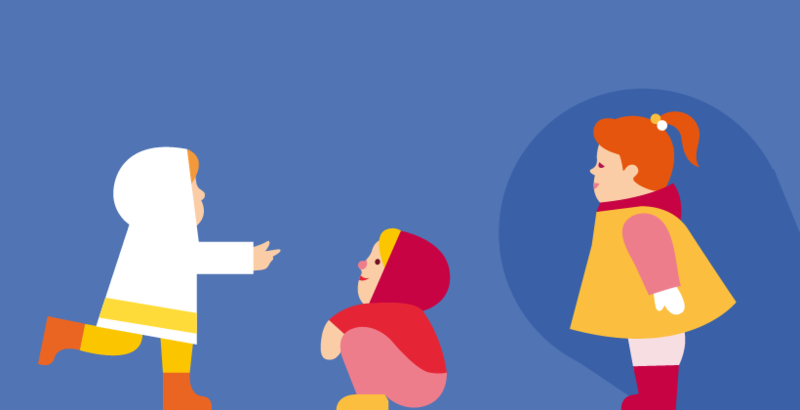 White Paper On A Strategy for Europe on Nutrition, Overweight and Obesity related health issues. Brussels, Belgium. Hayes K & the Expert Panel (2010). Fatty acid expert roundtable: key statements about fatty acids. Journal of the American College of Nutrition 29(Suppl 3): S285-S288. Foster R, Williamson C & Lunn J (2009). Culinary oils and their healths effects. London, UK: British Nutrition Foundation. Briefing Papers. EUFIC (2014). How to choose your culinary oil. EUFIC Food Today. Skeaff C (2009). Feasibility of recommending certain replacement or alternative fats. European Journal of Clinical Nutrition 63(Suppl 2): S34-S49. EC DG SANCO. Retrieved from EU platform for diet, physical activity and health: Commitment Database (website visited 22 August 2013). Roundtable on Sustainable Palm Oil (RSOP) (2013). Consumer Fact sheet: why palm oil matters in your everyday life. Kuala Lumpur, Malaysia.